Racing against the incoming winter. The average first frost in my area is this week, but the forecast is good for the near future. I can bring plants inside if there is a short cold spell. Brian, your greenhouse looks just great. Consider putting a couple ceiling fans in the top to push the hot air back down to the plant level during the winter months. This reduces the temperature gradient between the inside top covering and the cold winter weather outside, therefore your heat lost to the outside air through to film is greatly reduced. It helps keep the inside temperature warmer, and the temperature even throughout the greenhouse. I have three 20-inch ceiling fans that blow throughout the day and night during the winter. 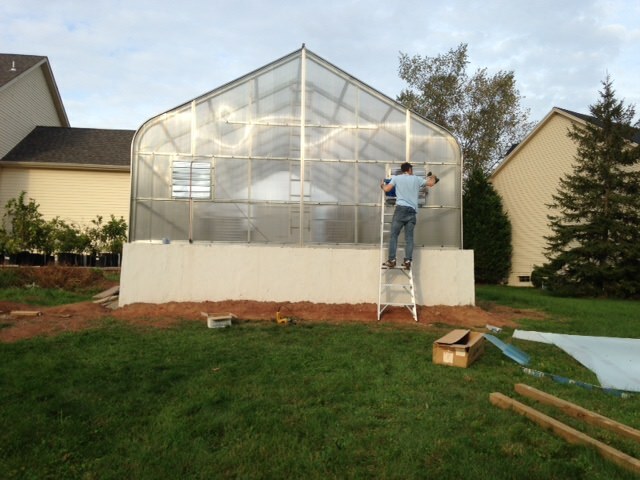 Spray a surfactant, Tween 20 is the common one to use on the inside walls to keep the greenhouse from dripping. Great job -- congratulation on a job well done. My peak is 18' so a fan mounted high directed straight down helps. Brian, what kind of covering did you use? Another example of how important it is to get pollinators in/out. Don't know why but my Gwen avocado's flowers were covered in flies last spring. It worked, got fruit! Two very good ideas, Millet, thank you. My kit comes with two circulator fans, but I agree a ceiling fan would be better for heat distribution. I'd like to do both. I have a lot of vertical space to work with so ceiling fans should fit just fine. And surfactant on the walls is something I'd never thought of. One thing I'm wondering about now is that the kit is configured so that the front vents and rear vent-fans are mounted about mid-height, which seems inefficient compared to a higher mount. However, because the front vents are relatively huge (3ft across?) there isn't much room to move them up before hitting the roofline. The vent-fans are only ~2ft so I may be able to move them around, but could require moving the supporting frame a bit which will take time that I don't have right now. How important is it that the fans/vents are placed high in the structure vs mid-level? I'm still not sure what I'm going to do about pollination. I'm leaning towards letting insects come and go, maybe just leaving front doors wide open in the daytime if they can't figure the vent slots out. One more thing... since I started building I'd completely forgotten that I originally intended to insulate the north wall. However, beause the greenhouse is at a bit of an angle, the north wall *might* be letting a significant amount of morning sun in during the summer months. I doubt its that much, though. Beacuse I dont have extra insulation on hand at the moment I am thinking I will leave it glazed for now and insulate it next winter if it doen't seem to provide meaningful light. Mark, this kit comes with 6mm dual-layer polycarbonate. I asked if they could do 8mm but was told it won't flex enough at the eaves. It has been somewhat of a pain to install because if a panel isn't installed perfectly straight there is no way to adjust it - it doesn't flex sideways.. I had to shave an inch or two from the sides of some panels as I installed them to prevent overlap. I am starting to see the attraction to polyethylene sheeting. Brian my front exhaust fans and rear intake vents are all at mid height. For 10 years I called on the Colorado, New Mexico and California greenhouse industry when I worked for a large agricultural chemical company. 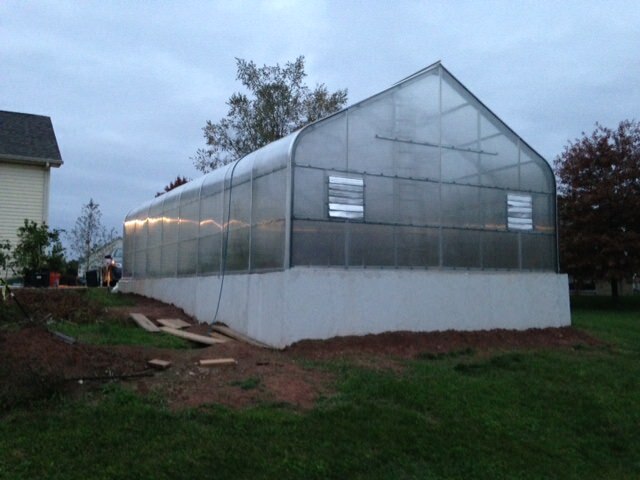 All greenhouses have there exhaust fans and intake vents at mid height. Never seen a greenhouse with them at ceiling height. You don't want exhaust and vent high. You want to retain the ceiling heat to use during during winter and use roof fans to blow the heat back down to your plants. In the northern hemisphere, the greenhouse north wall loses both heat and light. The greenhouse would be much better off if you insulated the north wall using those silver sided polyurethane insulation boards. 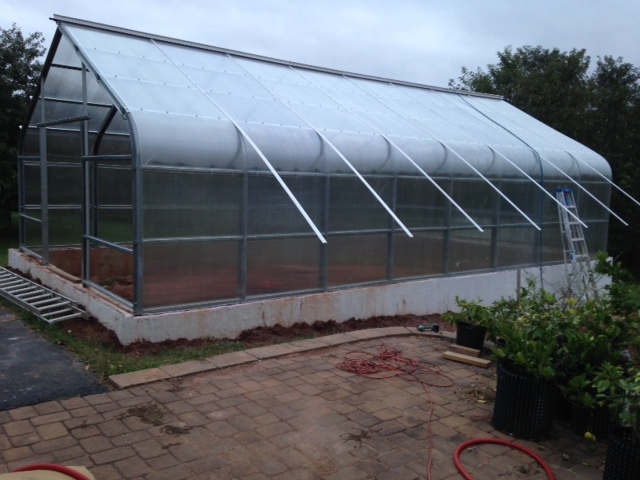 The silver coating reflects all the sun's rays back into the greenhouse. The plants love it. The two most important greenhouse items are heat and light. Thanks for the clarification on the venting. Good to know I was worried about nothing - and don't have to waste time moving things. I hadn't considered that I was not only not receiving much light in the north face, but that it was letting light escape also. Despite the 80% light transmission rating advertised on the glazing panels they cast a considerable shadow. I have been thinking about painting the inside of the concrete foundation white, and looking into white pebbles to cover the floor. The dirt floor makes it a bit darker than my old attic greenhouse that has the white floor and foil-faced walls. 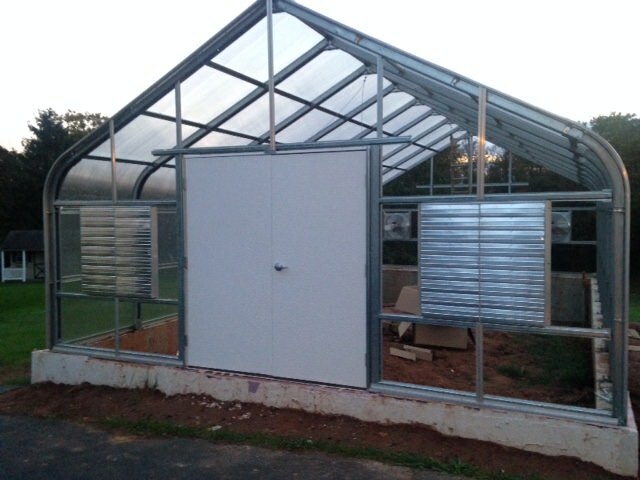 Another thought: If the exhaust fans and the inlet vents were located at the top of the two end walls, when the fans turn on all the incoming air would travel across the ceiling of your greenhouse and go right out the other end through the fans. All that air that just passes through and out the upper level of the structure is the air that contains the CO2 that the plants need as their food source. When the fan and vents are set lower, all the CO2 passes directly through and all around the plants. They get confused with UV inhibiting coverings. Seems UV and a clear views of the sky is what drives them. Glad you gotter done. Polycarb is the only way to go. Also, I think you'll be fine with the 6 mm. I use a large Melnor propane heater mounted about 10' up but have a cheapie freestanding propane burner from Home Depot as a backup in case I lose electricity. I also let my temps go down to 34F before the heater kicks on. All the tropical trees flourish - rollinia, avocados, mangos, pineapples, surinam cherry, pitaya, citrus, etc. Good to hear. I have direct natural gas by pipeline at my house, and natural gas is dirt cheap compared to all other heating sources I've seen. So, I'm not terribly concerned about heating but I hate to be wasteful. I am planning to rent a FLIR (forward-looking infra-red) camera once the greenhouse is done to see how well the insulation is working and identify air leaks, both on the greenhouse and my home. I also have double wall 6-mm polycarbonate on my end walls and side walls, but went with double air inflated 6-mill poly for the roof. Brian, it was a good decision to put in a deep concrete foundation. When we built my greenhouse we only concreted each perlin in the ground, and insured that the polycarbonate sides went several inches under the soil . Because of the cold outside temperature during the winter, and the warm climate inside, mice and other animals dig under the side wall to get inside. Several times a winter I have to add a layer of dirt against the outside walls and reseal the animal's tunnels. You mean the columns, right? I did the same thing and am having a bad rust problem at the base of the columns - Nexus Zephyr brand. How about you Millet, any rust? Mine started only a year or so after we built and I keep the floor dry. Mark, yes the columns. I also have a Nexus greenhouse. I have not seen any rust, and the greenhouse was constructed about 20 years ago. Yes I'm very happy with the way the foundation came out. It was a ton of work but seems to have been worth it. I expect the soil will stay warm. I've had ~32F nights where I hauled all my trees into the garage, and it looks like a string of 28-30F nights is coming. I have glazing up everywhere except the north side. Once the north side is up it should hold some heat even though I will need to go back around and seal up various edge bits. It is already 5-6F warmer all night inside the greenhouse than outside with no heating, despite the incomplete glazing. I'm assuming this is from retained heat in the soil. That looks fantastic ! You have done a great job ! That really pisses me off especially after complaining to the head sales rep and being told it was my fault. Brian your in the wrong profession. You should have been in the greenhouse building business. Brian, are you planning on having a solid wall on the greenhouse's north end? North walls of a greenhouse lose light to the outside. A solid insulated north wall painted white on the inside does not allow the light to pass through as it would if it was glazing, but reflects the light back into the greenhouse giving more light and heat to the plants, (and the heat bill goes down). Again great job. Yes, I'm planning on insulating the north wall. However, I haven't figured out exactly how I'm going to do it yet and I'm running out of time. I decided to just put the glazing up on the north side for now and figure out the insulation later. I can't just build a wall out of foam board as it wouldn't be strong enough... you could punch a hole right through it. I don't want to use plywood because it will rot. installing a "foil bubble wrap" type radiant barrier like EcoFoil, Reflectix. This stuff is often mocked because it provides basically zero R-value unless you create sealed air gap. However, in my case it would have a ~2in air gap which would provide some real R-value along with reflecting light and radiated heat back inside. My worry with most of these options is that moisture will still collect in the north wall and cause mold to grow with no airflow. I might just remove the glazing next year and install vinyl siding that matches my garage, with insulation behind it. I have some time to think about it. I'm okay with having a sub-optimal setup for this winter. The double-doors are foam-filled insulated doors, and already white, so that covers part of the wall. So, all the glazing is now in place. It looks complete, though I still have to install the aluminum strips that cover the seams on the north & south walls. Still have to run heat and electric, install the fan & vent control thermostats, seal up the gaps where the glazing meets the foundation, put another coat of stucco on, and level the dirt inside. In its current state I think I've bought myself a few weeks time. 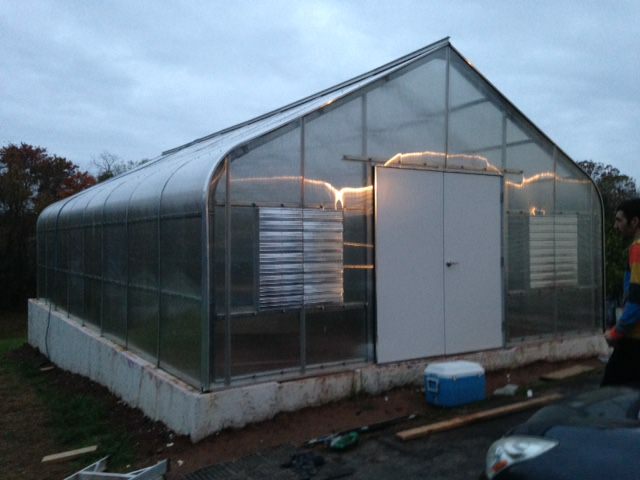 I can move all the plants inside and use a portable propane heater to provide some heat. I'm looking for an HVAC contractor to run the gas line. The exterior of the north wall on my greenhouse is glazing. I put silver sided polyurethane insulation boards (4X8 2" thick) attached to the glazing on the inside north wall. I guess it has been up maybe 15+ years with zero problems. No mold, no nothing. However I live in a semi-arid area, but of course the humidity inside the GH is always high. I also painted the silver insulation boards white, because white reflects sun light ever greater than silver. What about spray foam? I know they sell DIY kits. It does act as a vapor barrier so you wouldn't have to worry about moisture collecting behind it. The R value is very good per inch. It may be a challenge to get a finished look as you would probably have to cut some excess foam to get a smooth finish.